This week we are featuring our exquisite Beveled Men’s Band in Cobalt, proudly made in the USA. 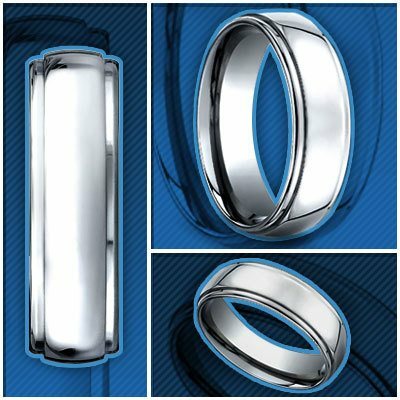 This beveled Men’s band is 7 millimeters wide and features a high polished cobalt finish and rounded inside edges for a comfort-fit. At $195 (compared to $795 for 14k white gold), this Cobalt band contains a special blend of alloys that exude high luster and strength. Not only is the price attractive but Cobalt is also hypoallergenic, scratch resistant and bio-compatible, and therefore widely used for medical purposes. Like this band? Check it out here: Cobalt Beveled Men’s Band. You may also browse our entire collection here: Men’s Wedding Bands.